I learned from my year in the Marshall Islands that paying market wages to artisans in developing countries, although a fundamental of economic justice, is only a partial solution to fostering true local economic growth. The Marshall Islands, like so many countries, is caught between a western monetary economy and its original self-sustaining system of barter and trade. Too reliant on modern currency, clothing and TVs to revert, but lacking the resources to compete globally, the Marshall Islands languishes in between two worlds. While I was there, volunteering with the Ministry of Education and acting as an ad hoc journalist, it never became clear to me which direction benefited the Marshallese, a progression to modernization or a return to traditionalism. 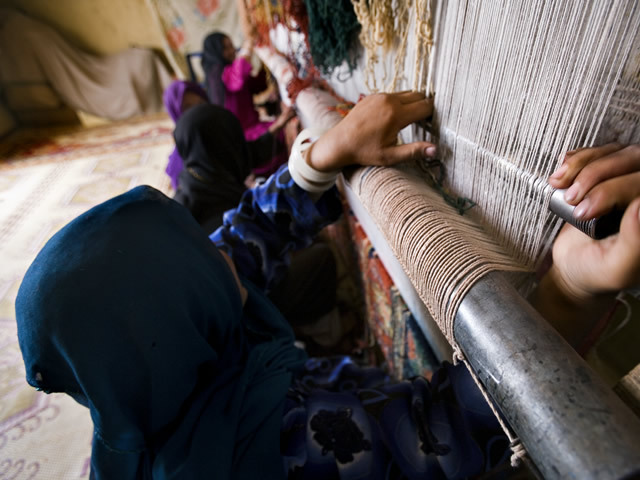 I’m sharing this experience to underscore my regard for Arzu Rugs, an organization that supports Afghani women through commerce, education and health care. Although technically a non-profit, Arzu (which means “Hope” in Daru) is working to become self-sustaining through its rug sales. With the awareness that money alone will not change people’s lives, Arzu goes beyond providing a market for Afghani rugs to establish structures for future growth in Afghani communities. By combining income, education and health care, Arzu is transferring the balance of power from foreign groups to individuals and family heads throughout Afghanistan. Weavers are paid fair price and receive a 50% bonus upfront if they agree to Arzu’s ‘social contract.’ The social contract mandates that all children under the age of 15 in the woman’s household attend school full time and all women in the household attend literacy classes. If there is not a government school nearby, Arzu sets up schools in the local village. Health care initiatives under the social contract focus on reducing the country’s maternal mortality rates, which rank the second highest globally. The organization partners with local health care practitioners to provide its community of weavers pre- and post-natal check-ups as well as transportation to the appointments. As of 2007, more than 2,000 women were receiving fair wages, education and healthcare in exchange for their handcrafted rugs (Arzu’s figures are somewhat outdated). Measured against the limited opportunities that Afghan society allows women, the impact and intelligence of Arzu’s work is remarkable. I think this is the future of social good. I don’t want to donate money to a cause that will hound me with mailers asking for more money before my initial check clears. I want to help causes that become self-sustaining. That means I get to see progress and the people I’m helping get to be independent. LOVE the social contract idea – we have seen this work where some sort of “incentive” to get the kids into school really gets the ball rolling on change. LOVE that they will build a school if there isn’t one. I don’t claim to be an expert in the field, but I do see some inconsistencies in your logic. I do, however, appreciate the fact that you took the time and effeort to address this sensitive issue. Thank you. Thanks for your comment. I’d love to hear more of your thoughts as I’m not an expert either.